This is the cream of the Christmas movie crop. The one I look forward to every year. The 1951 British version of Charles Dickens' "A Christmas Carol" will stand the test of time as the penultimate version of this tale. With flawless direction by Brian Desmond Hurst, this well-known story of a miserly Counting House owner; and the effects his mean spirit have on all those around him; come alive with the incredible acting of Alistair Sim. No one comes close to portraying the mean spirited Mr. Scrooge, as well as his unbounded joy upon his redemption, as well as Mr. Sim. Noel Langley did a wonderful job of turning one of the very best Christmas books into a faithful adaptation for the screen. The 1935 British version, as well as the later American version, both lacked that indefinable something which makes any artistic endeavor worth the effort in the first place. And the movie has been done several times since, but this is the version I would choose over any other. Britain, at the time this movie was filmed, was still in the throes of the aftermath of the Second World War. They were still using ration books for food and sweets, as well as gasoline. Remember, the British took a hell of a hit before we joined the war in December of 1941. I mention this only as a possible explanation for the remaking of this film in the first place. When I watch this film I tend to think of the Three Spirits as being allegories for what Britain had been before the war; what she endured during that war; and her hopes for a better future. Is that simplistic? Maybe. I also watch this film with a copy of the book by my side. It's so loyal to the original prose, that there are whole pages where you can read along with the movie. It's then that you see, and feel, the brilliance of Mr. Sim's remarkable performance. To have the ability to act out the words, just as the author intended, is a joy to watch. 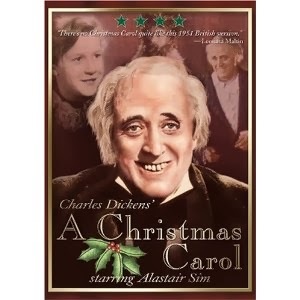 I have to wonder what Charles Dickens would have thought of Mr. Sim's giddy version of Scrooge on Christmas morning. I suspect that he would deem it perfect. If I had only one holiday movie to choose from, this would be it. The lessons penned by Dickens so many years ago, still resonate today, when the world is still full of Ignorance and Want, mankind’s two worst enemies. I didn't say it - Dickens did. I just happen to agree.